LawBreakers review: "An exhilarating, eclectic, yet tightly designed FPS theme park"
Mixing eclectic elements from throughout the genre’s history, but making them all entirely its own, LawBreakers is an immediate, energised shot of FPS purity, with intelligence, depth, and exhilarating strategy to spare. Could everyone just play the damn objective, please? In terms of pure gameplay, I’ll be surprised if there’s a better FPS than LawBreakers this year. I’ll be surprised if there’s a better pure action game of any variety, in fact. Forget that it’s a mid-scale project from a new studio. Forget that it’s a multiplayer-only team shooter. And definitely forget the early, asymmetric comparisons to either old-school arena-shooters or the modern ‘hero’ variety. It would be easy to call LawBreakers ‘Overwatch for Quake players’, but that would also be lazy and somewhat inaccurate. LawBreakers is more than that. It’s more distinct, and much more clever. Playing like an infeasibly well-designed cheese-dream of the genre’s last 20 years, LawBreakers’ shape is as blunt and straightforward as its gameplay systems are not. Eight maps, five modes, nine character classes. On paper, it sounds simple. In practice, the last of those three factors turns LawBreakers into a game of nigh-endless possibility. The unbounded creativity with which LawBreakers’ characters are designed is, whatever other factors might be in play at any time, the hot-burning fuel that consistently ensures as much long-term compulsion as in-the-moment excitement. And there is a lot of both. While LawBreakers’ movement and shooting are never less than a delight, further exploration reveals that each class is far more than the sum of its parts. Consistently surprising, with barely a hint of cross-over functionality between them, LawBreakers’ nine classes are all crafted with such specific vision that each could be from a completely different game. From the high-speed, floor-sliding, wall-bouncing, hit-and-run skirmisher, Wraith, to the shield-planting, armour-boosting, Hulk-jumping Juggernaut, to the more static, refined, long-range accuracy of the Gunslinger, to choose a new class in LawBreakers is to effectively reboot the entire game in a completely fresh (and newly brilliant) configuration. Maps suddenly look different. Environments, paths, and spaces are born anew, as fresh abilities, traversal methods, and combat skills reshape their meaning. That tight corner might be a tad risky for the Titan, heavy, slow-responding, explosives specialist that they are, but to the Gunslinger – who can throw a radar-knife to temporarily trigger the ability to see through walls – it’s a fertile hunting ground, where would-be attackers will be in his sights long before they appear in the flesh. An exposed objective point – say, the pick-up platform in Capture-the-Flag variant Blitzball – might be a scene of prolonged, cat-and-mouse power struggle for most classes, but if the nimble Assassin can pick her moment well enough, she can simply hang on the periphery, trying not to be noticed, before grappling cleanly in and out, prize lifted straight from under the noses of the combatants. If her path out of there is fast and tricksy enough to counteract her comparatively low health (or she gets the right support from Battle Medics, or the right covering fire and diversions from her team’s heavy hitters), then cunning, physics-savvy use of her hook, triple-jumps, and dash can get her back to goal within three or four seconds. Better just hope the other team hasn’t had the foresight to leave a Juggernaut guarding the scoring zone. But surface class abilities are really just the start of it. They’re the start of a staggering amount of fun, mind, but that fun - while quickly accessible - will expand exponentially during your first few days’ play. While LawBreakers’ immediate and instinctive movement and shooting are never less than a delight, whoever you’re playing as, a little further exploration reveals that each class is far more than the sum of its parts. Some are quietly hinged around a key ability, which binds, amplifies, and recontextualises all of their others in an initially unseen way - the way the Juggernaut shield can be used to create bottlenecks and flanking points, for instance, in order to feed opponents toward his shotgun. Others excel when thrown into the right environmental scenario, or at the correct objective, or have some deeper functionality that counters a seemingly impossible assault if played right. While LawBreakers maintains the immediate, kinetic, exhilaration of all the best FPS, at the same time its malleable depths and steadily unfurling systemic secrets give it the soul of a fighting game. 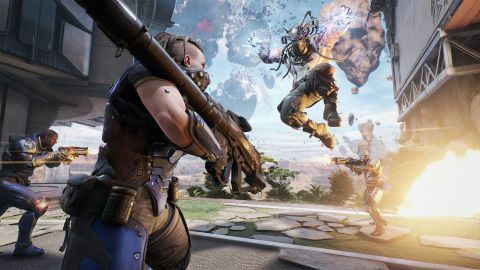 LawBreakers might make its giddy first impressions with bold, brash, high-flying speed – there’s a zero-g area on every map, capable of generating surreally cinematic shoot-outs whenever engaged – but it’s also a gleefully intricate, deceptively intelligent sandbox, holding buried treasures aplenty. Not that this long-tail of discovery makes for an intimidating prospect. There’s a reason I use the word ‘discovery’ there, rather than ‘learning’, and that reason is the uncommon ease with which LawBreakers’ sometimes initially confounding classes reveal the fun. There’s something lightly magical about the deft combination of control-feel, audio-visual feedback, and quietly telling ability cooldown timers, that parses knowledge almost ambiently. I’ve become adept (or at least decently functional) with six of the nine classes so far, and each time the journey has been the same: A first game spent wondering what the hell is going on, and trying (perhaps too hard) to make sense of my new character amid mild frustration, followed by a moment, not long later, where everything suddenly just clicks, the clouds part, and a whole new game appears. It has a high skill-ceiling alright, but the way that LawBreakers tutors you feels less like teaching and more like it’s planting knowledge into your head via osmosis. Simply play it, explore it, enjoy it, and the understanding will come much faster than you think. It helps, of course, that LawBreakers’ game modes are such a great showcase for its systems. Entirely objective-based, the sharply crafted maps they play out upon are cannily designed for a flowing journey between intricate tactics and broad-strokes, airborne spectacle. With a great deal of cross-map traversal and point-to-point assault punctuated with intense bouts of more intimate attack and defence, a single round of most modes will melt and shift its focus so many times as to cram in far more than its timescale has any right to. Throw in the greater, extra level of player-driven empowerment that comes with cross-class co-operation - a good Battle Medic can turn a Gunslinger into an absolute wrecking ball, for instance, just as the aerial-focused Harrier’s power-tank drops can extend the Juggernaut’s armour-buff to borderline rude levels - and you have a game that’s unpeeling new surprises on an hour-by-hour basis. It’s a shame then, that at this early stage in LawBreakers’ life, team balance occasionally hinders the great work being done by the game’s systems. Probably the product of a young, inexperienced community as much as any fault of the game, the fact remains that at the moment, LawBreakers’ match-making doesn’t always get it right. At its best - which is a lot of the time - the game throws up some of the tightest, most exciting bouts of anything-can-happen competitive FPS I’ve played in a long time. When things don’t work out so well, it’s not unknown for a couple of strong players to be teamed with three objective-dodging carries, sometimes writing off a match as soon as it starts. Between-game lobby shuffles eventually ease the problem, and the issue will no doubt soften further as the growing player-base gains more understanding of the game, but a tune-up to LawBreakers’ match-making would certainly be welcome at some point. A tweak to the scoring system, which right now perhaps doesn’t effectively reward the objective play that actually wins matches, might help as well. But although noticeable and recurrent, such situations are a minority case. The majority of the time, LawBreakers is simply delivering a multi-flavoured, ever-changing barrage of pure, FPS joy in whatever formulation you care to enjoy. Its brave, bold, and intelligent approach to class design alone is an invitation to deliciously eclectic, energised play. But once you dig a little deeper, and come to understand the true breadth and depth of what LawBreakers really offers, you’ll find a game that you can make and remake with a degree of fun-filled agency still all too rare. LawBreakers is a game that really understands the immediate, kinetic, emotional and intellectual heart that makes FPS such a vital genre, 25 years after its inception, and sets out to create an exciting, varied, yet tightly designed theme park with that knowledge. It executes on that plan marvellously. When I’m not playing LawBreakers, I’m thinking about LawBreakers, while counting down the time until I can play it again. And without even taking the low price-point into consideration, I’d highly recommend that – if you care about the genre at all – you join me as soon as you can.